The news website is a powerful promotional tool for our clients. According to a recently conducted research, the number of people unfamiliar with the business reading it is increasing. It is therefore highly advisable to share our articles and to recommend your potential clients the reading of the news website. Each of the sections helps the purpose of business promotion. How to use them effectively? This section contains the latest information about the gold market, including prices, forecasts and important events. This information is important in that it helps to attract the interest of people completely unfamiliar with the business. Potential clients can then have a more positive attitude towards the business and the possibility of earning with gold. This section contains information on how the gold market functions and why gold is a profitable product. It is important because it informs people about the possibility of running their own businesses with gold and thus, earning much more than in a traditional job. How to properly use this section? Send your potential clients links to the news of www.globalintergold.info website. Find out if your potential clients are interested in earning opportunities by asking for feedback about the articles. Here you will find information about contests, competitions and promotions of the company, as well as practical advice on business development. Explore this section to read news about the particular success stories of leaders and the awards they have received. Use this information as demonstrative evidence to show potential customers that they can actually win any contest and get valuable prizes themselves. Do not hesitate to share your own achievements too. We can publish an article about you! If you participate in one or several competitions and you are about to savour victory, write down your success story, send a good photo to our Customer Support Service and let us share your story with the rest of the world. News on upcoming and recently held events devoted to gold business are published here. The attendees of GIG’s conferences live in different countries and these events are meeting points for them, where they always spend a very productive time together. Show this section to your potential customers, find familiar faces on the shots, and get to know when the next event is held. Go through these galleries to see professional photos and videos made by the company’s camera crew. These visual materials are helpful for highlighting many of the benefits of the gold business. 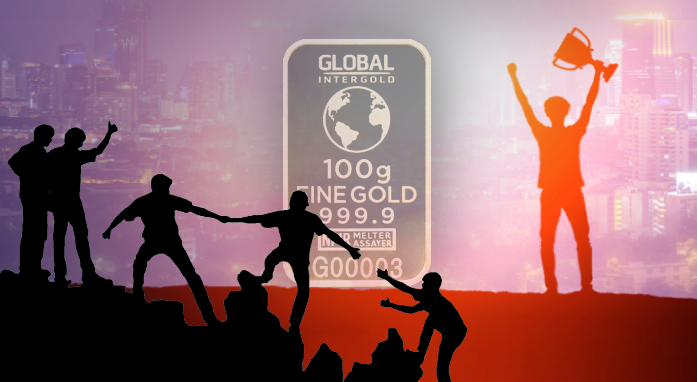 When in the home page and beneath the articles, you will notice a banner leading to the article "How to become a Global InterGold Online Gold Shop client and earn with gold?" This article has user-friendly but concise information about the steps to take to become a customer. Share it with your potential customers when they start considering the idea of conducting their own gold businesses. Many customers have started their businesses thanks to this article! The news website is a powerful promotional tool that can be used to attract new customers. Share its articles in Facebook, G +, Twitter, or LinkedIn, or post them on your own social media. We produce professional and useful materials to facilitate the promotion of your business. Many clients started their businesses thanks to the article “How to become a GIG client”. Do not forget to leave a comment below this article! This will help you to further attract new customers! Leave your contact information there to help them getting in contact with you. Setting a profile picture of you in a GIG event mentioning your country and city is a very good strategy too. This information has been found to be useful to potential customers as it increases the chances of new ones contacting you.